PC Roisin Vafaee is the university’s new Police Liaison Officer, and you’ll find her across our campuses. 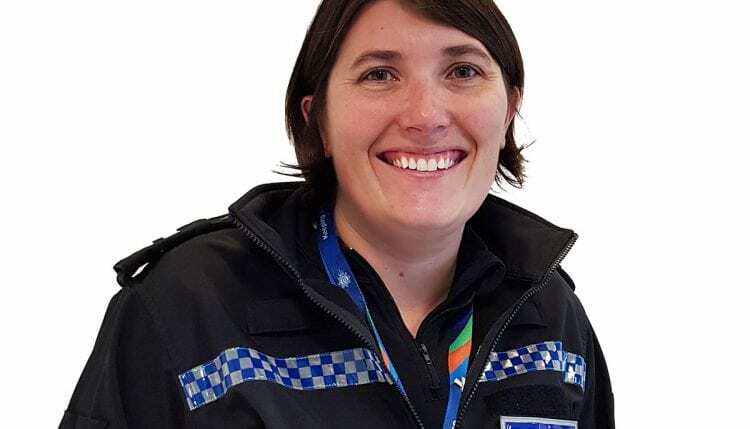 We caught up with PC Roisin recently to ask how students and staff alike can make the most of police services at the university. She also talked about her background – and recalls a remarkable story from her career in the police force. The full interview can be listened to or watched via the links below, or you can search ‘University of Brighton’ on Apple Podcasts, Spotify and Google Podcasts to download the episode on your device. Alternatively, you can listen on the university’s podcast page or read a taster of the interview below. You can reach out to PC Roisin about any issue that you wouldn’t necessarily call 999 or 101 about, but is troubling you all the same. You can speak to PC Roisin in confidence. The exception is if you or another person is in danger. She may then be required to share the information. But she will always let you know that. You can contact her by emailing R.Vafaee@brighton.ac.uk, by calling her on 07921 459005, or via Twitter​. Her normal working hours are Monday and Wednesday 8am to 5pm, Tuesday and Thursday 8am to 2pm. Or for more information, visit the Safety and Security section of the university website. What is your role at the university? My role is to permanently be a police officer on campus, I am still a Sussex Police officer – but here on campus I’m here for staff and students, all through the week along with my colleague Lee (Cook), who’s been here considerably longer than I have, so we can be approached by the staff and students for any kind of concern whether it’s a criminal matter, mental ill-health is something that comes up a lot for us as police officers and ultimately our goal is to keep students engaged, students on their courses and make it to the end of their course and graduating, regardless of whatever bumps in the road they come across. I’ve been a police officer for about 11 years, I’ve spent most of my career in Shoreham and Worthing, but I’m Brighton born and bred, absolutely love the place, delighted to be back here – but I’ve always done frontline policing, so that means if you dialled 999 in West Sussex, I would have come out to you with my blues and twos on, or latterly, I’ve been involved in the investigation side so when someone comes out to you, after you’ve called 999 and maybe arrests somebody or takes a statement from you, we’re then the team that are interviewing people in custody, carrying on the investigation, and that’s what I’ve been doing up to the point that I came here. It must be a very unique job for a police officer working with a very wide mix of characters and roles? Yes, and you get a little more time to deal with people here – a little more time to think through what the different solutions are to the various problems that we come across. Brighton’s brilliant, there’s a wide range of people in Brighton and the university really exhibits that – so I get to work with all of them, and actually my primary goal is to help them succeed, really – it gives you that fuzzy feeling. I’ve noticed that – I wear my uniform, I don’t have my ‘Batman-belt’ on or my stab vest but I have my big sign written ‘police’ on my jacket so that’s very obvious and I make a really effort to say hello to people so, by all means, just come straight up to me and say ‘hello’. If you want to raise a more generic issue, or you’re really annoyed because you’ve seen something going on in the community, you can just tweet me (@PCRoisinVafaee) and also I’m based in the Manor House, I’m more than happy for people to come and knock on the door – just bear in mind we’re not always here as we’re out and about across all sites at the university. What or who inspired you to join the police? I’ve never really been able to nail what it is about being a police officer – but my mum and my grandma are really inspirations to me, they are absolutely solid independent women, not career driven as such but very determined to have their own careers, their lives independent of their husbands, whilst also very much enjoying happy marriage and happy family. My grandma came to England from Ireland in the 1940s, having overheard somebody tell somebody else the address for the Royal Sussex County Hospital – she memorised that address, went home, wrote a letter and asked to get on a nursing course and came. Everything she did from there on I think is amazing. My mum is my mentor, she absolutely coaches in me, in all aspects of work, even now I’ll go back to her and say I’m not quite sure if I dealt with that problem right, how I came across – so my mum and my grandma mentor me throughout life. What is the most rewarding moment of your career? That would be delivering baby Thea. Me and another colleague, Jenny, who is a Brighton police officer, we were on duty, four and a half years ago – we were just at a petrol station, they had had a theft of fuel, and this man frantically comes running up to me saying “help, help, my wife’s giving birth”. I met Beth, and within about 6-8 minutes, baby Thea was born into my arms, which was just an absolutely phenomenal experience. It got me broody so I had my second child nine months later! I’m very much still friends with Beth, that was our first encounter, we’ve got this fantastic friendship – Thea has gone off to school this September. It just doesn’t get better than that – human life. Quick-fire questions away from your work – first up, favourite place in Sussex? The South Downs Way. Absolutely love it. I’ve biked the whole thing from west to east – the whole thing’s beautiful. I’m very excited to be reading Harry Potter to my five year old, I like to read things like Runner’s World, Trailing Running magazine, and I’m an avid podcast listener. I’d already listened to this podcast, I listen to things like Marathon Talk and Women’s Hour. Starts on a Saturday morning with parkrun – me and the kids like to cycle down there – they absolutely love volunteering. We’d spent all of Saturday afternoon just lounging round the house, me, the kids, the husband – just watching films, chilling out. Then on Sunday I would hand the kids over to mum, and I’d get up on the South Downs, either on my bike or running and just enjoy the South Downs Way. Finally, if you could invite three people to dinner – past or present – who are they going to be? I’d like to invite Dervla Murphy, brilliant books, brilliant person – just brilliant, inspiration. Alastair Humphreys, same kind of thing but he’s much more recent – and if you’ve spent four years cycling round the world you’ve got to be an interesting person to listen to. And then one which is a bit more obscure is a cyclist called Lee Craigie, I’ve listened to some radio shows she’s done on BBC Scotland, and she just sounds fascinating – she has an absolutely lovely voice to listen to. She was a mountain bike competition and now she does a bit of touring stuff – I’ve never cycled anywhere further than the South Downs Way but I would love to. Listening to people that have would just be brilliant.